Water kefir (keh-FEER) grains are used to produce a naturally carbonated probiotic drink. The kefir grains are small clusters of beneficial bacteria and yeast, bound by a polysaccharide (dextran) that is produced by Lactobacillus brevis. This is all good news for maintaining a healthy microbiome, which is essential to good health. 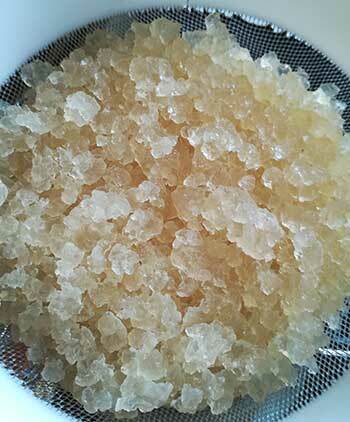 The grains are added to a solution of water and sugar and left to ferment at room temperature for 24 to 48 hours. The bacteria and yeasts in the grains feed on the sugar to produce lactic acid, a very a small amount of ethanol, and carbon dioxide. The grains are then strained; the fermented kefir water can then be bottled and fermented for a further 24 hours or longer to produce a naturally carbonated probiotic drink. It can be flavoured with everything from lemon peel, dried unsulphured fruit, herbs or spices. If the grains are happy they will multiply and you can carry on the tradition of gifting some to family and friends. Your grains need water, sugar and minerals to do their thing. Do not worry about the sugar, your kefir grains will consume it and convert it to lactic acid. There will always be some amount of sugar remaining in your water kefir, how much remains depends on the amount of sugar used, the volume of grain growth, and how long your grains are left to ferment. Volume of grain growth: To promote grain growth you need to add a source of minerals, such as organic blactstrap molasses, and occasionally I will add a pinch of unrefined sea salt. The longer your grains ferment the more sugar is removed: However there is a balance to be maintained so that you don’t starve your grains. About 48 hours, at room temperature, is generally recommended. Use filtered or spring water rather than water straight from the tap. If you are using white sugar then you need to add a natural source of calcium and magnesium. Blackstrap molasses is made from the ingredients removed during the refining of white sugar, so adding some to your solution of sugar and water helps to reconstitute the sugar close to what it would contain in its natural unrefined state. A healthy digestive system is fundamental to a healthy body. The gastrointestinal tract is home to over 500 strains of bacteria. The colony of bacteria, yeast and fungi that lives on our skin and hair and within our body is referred to as our microbiome. Probiotics feed the good bacteria, which helps to keep the bad bacteria in check. The benefits associated with a healthy microbiome include improved digestion and assimilation of nutrients, improved immune response, influences hormone production, energy levels, pH balance and boosts the elimination of toxins. Water kefir is easy to make and economical. There are so many recipes and many applications. As well as making an endless variety of delicious beverages you can use it in other fermentation processes such as making condiments and fermented vegetables, as well as baking.